* Get unlimited access to millions of African & international musical contents now! * Install Boomplay now to download the best new songs & videos from your favourite artists! * Discover and stay updated with new releases or artists, latest/trending topics and entertainment news. * Choose any of our ready-made playlists to suit your mood, create your own personalised playlist or simply follow your friends and other users to see what they are listening to. Enjoy millions of African and international music/videos! 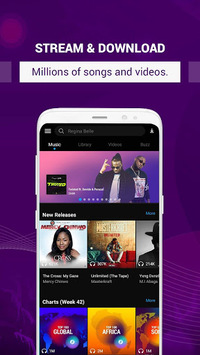 【Unlimited Music】Get access to unlimited African and international music and videos. 【Offline Play】Subscribe to our premium plan to enjoy unlimited offline plays without using more data. 【Quality Playlists】Create your own or explore any of our ready-made playlists that suit your mood and follow other users to see what they are listening to. 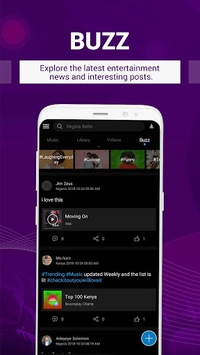 【Transparent Charts】Discover trending music via real-time charts that are updated automatically based on plays. ➤ Subscribe to daily, weekly or monthly plan to save unlimited music and videos for offline play. ➤ Playlists: Browse through and enjoy unlimited playlists created by our experienced music editors or simply create your own playlist with your loved songs. ➤ Charts: Get to know the most-played 100 songs in your region every week. ➤ Suggested Users: Explore celebrities and other users to see, listen and download their playlists. ➤ Albums: Play and download your favourite albums anytime, anywhere. ➤ Pre-order: Be the first to download albums, EPs, singles and more from your favourite artists before the official release date. ➤ Equalizer: Adjust audio quality with our preset African genres. ➤ Transfer Coins: Transfer Coins to other registered users within the same country as yourself. 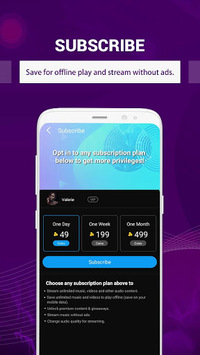 Coins are used to make purchases or pay for subscription within the app. ➤ Lyrics: Sing along to your favourite songs with lyrics synchronized to every track. ➤ Freebies: Win free Coins by playing the Lucky draw daily. ➤ Notifications & Chat: Be the first to know of new releases and interact with other users directly. ➤ Moods: Enjoy music suited for your current mood and state of mind.